Over the years, the airline industry has been plagued by financial troubles. Most of the major U.S. carriers have had to declare bankruptcy at least once during their histories, and costs like high fuel prices present a constant challenge. But as much as customers hate them, baggage fees and other tacked-on charges for travelers have made a huge difference to the bottom lines of airlines. Charges of $25 and up for checked bags and in-flight snacks may seem like small change, but they add up to real money for airlines. In fact, the fee strategy has been so successful that some airlines are looking for new premium services to give their customers. "Thank You for Checking Your Bag and Keeping Us Aloft"
A recent report from Ideaworks showed how fees have added billions to airline profits -- $22.6 billion, in fact, at 50 airlines worldwide last year. Some carriers have done a better job of shoring up their finances with fees than others. United Continental (UAL) led the way in 2011 with $5.2 billion in so-called "ancillary revenue," which includes all the added costs you pay on top of regular airfare. Delta (DAL) came in second with $2.5 billion, while bankrupt American Airlines was No. 3. Moreover, carriers have gotten creative about finding ways to justify extra fees. 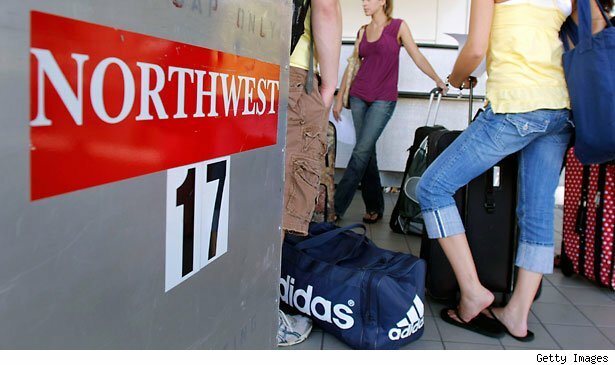 For instance, even though Southwest Airlines (LUV) doesn't charge baggage fees for the first two checked bags, its early check-in feature and carry-on pet policies earned it enough revenue to put it in the top five. Airlines point to record on-time arrivals and the least lost baggage in decades as evidence that fees are working. Now they're getting creative, coming up with revenue-generating services, and not just convenience fees. For instance, American just came out with a service that will deliver your bags directly to your home or hotel, allowing travelers to avoid having to wait at baggage carousels to pick up checked bags after their flights. With fees starting at around $30, American and delivery partner BAGS VIP Luggage Delivery hope that enough customers will be willing to pony up for convenience to justify the offering. Still, airlines need to be careful. High fees have made it cheaper in some cases to use traditional delivery services like United Parcel Service (UPS) to send luggage in advance, rather than taking it with you on your flight. Although a $25 fee is still cheaper than using a regular shipping company in most cases, higher fees for oversized bags make it worth researching and comparing costs. Like it or not, air travelers can expect to see more such fees in the future. Motley Fool contributor Dan Caplinger didn't appreciate the $95 in baggage fees he paid on his recent vacation. He doesn't own any of the companies mentioned in this article. Motley Fool newsletter services have recommended buying shares of Southwest Airlines.